During the May half term my family and I were lucky enough to get the opportunity to go glamping in Stratford-Upon-Avon with the Youth Hostel Association (YHA). We have stayed with the YHA a couple of times now and really love their range of alternative accommodation that is available across the country so were excited to get the chance to try out the bell tents this time. We chose to go glamping in Stratford-Upon-Avon as it is such a beautiful part of the country and only 2.5 hours from our home, which I think is a suitable travel time with young children and it was somewhere that only I had previously visited and as that was 15 years ago it would be nice to explore it again together as a family. We arrived at the YHA at about 5pm, although we could have checked in from 2pm and were relieved to find the car park had ample space but was also very close to the tents so moving our luggage over wasn’t going to be an issue. We checked in at the main reception, which is a beautiful big building that looks more like a hotel than what most people imagine hostels to look like, and were greeted by very friendly staff who explained everything to us and then showed us round to the bell tent. The bell tents are behind the main hostel in a private garden area which is really quiet and quaint with a small green house and a lovely mosaic design on the wall. We stayed in number 1 which was closest to the toilette and the showers, although all three are very close to them and as they are only used by those in the bell tents they were never too busy. The bell tent itself was a lot bigger than I imagined with two single beds and one double, all off the floor with proper mattresses and made up ready for us. 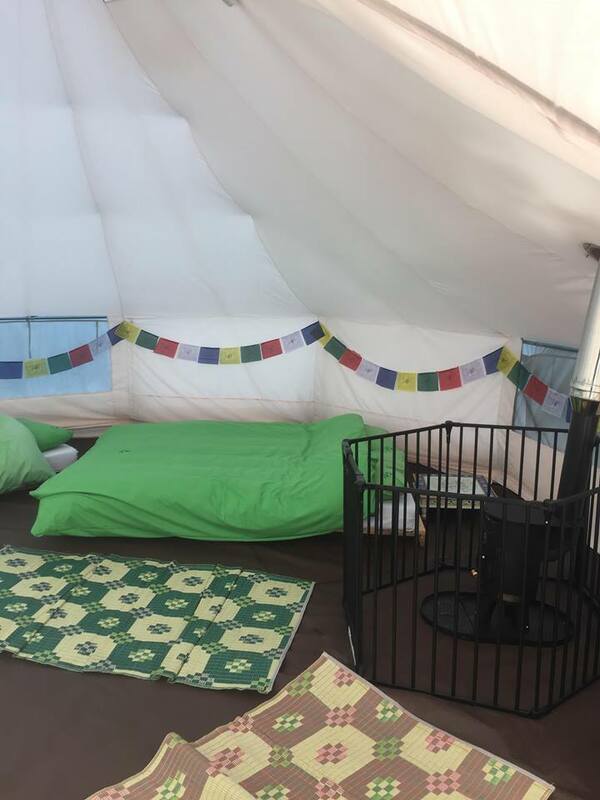 Despite 4 beds, a side table and a ottoman style box there was still plenty of space for bean bags and a fire as well as room to walk around, which can be done at full height as the bell tents are so high. These really are very spacious and ideal for families or small groups to share. The wood burning fire looked brilliant and we were also given complimentary wood for the first evening which we really wanted to use but the weather was so warm we didn’t get the chance. The fire is surrounded by a fire gate so there is no need to worry about children or animals getting burnt either which is a huge relief when camping as a family. Although the weather was extremely warm and the fire wasn’t required we did still experience a massive storm on our first night and there was a small part of me that wondered what on earth we were doing in a tent, miles from home, in the middle of a storm, however we needn’t have worried as the tent protected us entirely from the elements. Apart from the flashes of lightening that lit the tent up we wouldn’t have know about the storm as not a drop of water managed to get in and the wind didn’t make us feel unsteady at any point. However it is important to point out that had we felt unsafe we did have access to the main building 24 hours and we did have an emergency contact number for the staff had we needed it. During the two days we were there we explored the main hostel and the grounds. Inside we had access to a games room which had giant jenga and giant connect 4 that the kids loved playing as well as table football and a pool table that you could use for 50p a game which we thought was a bargain, especially when one game of pool with an 8 year old lasts a LONG time! We also had access to a lounge area where there was a TV and lots of books for both children and adults as well as giant dominoes. 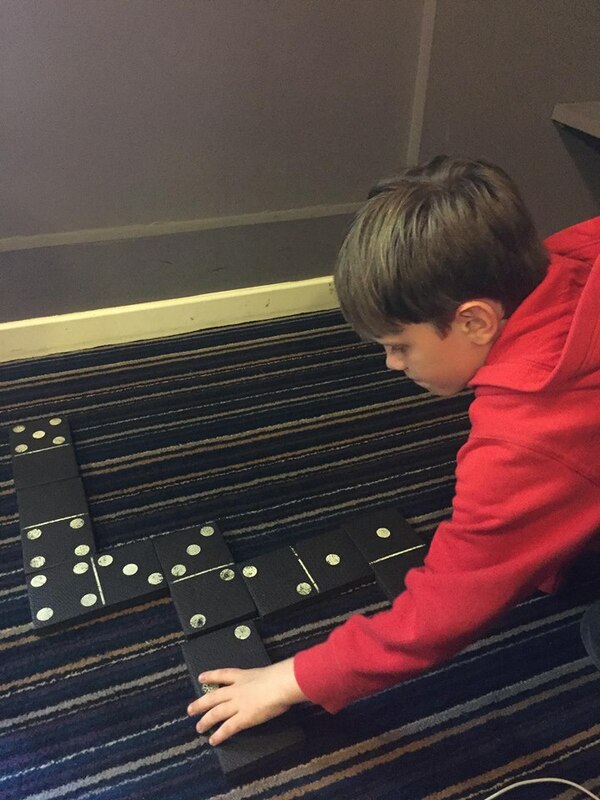 More board games were also available on request from reception. As with all the hostels we could also use the self catering kitchen to prepare any food we wanted as well as additional toilets too. We chose to use the self catering option for breakfast and lunch but ate in the main restaurant on both evenings. 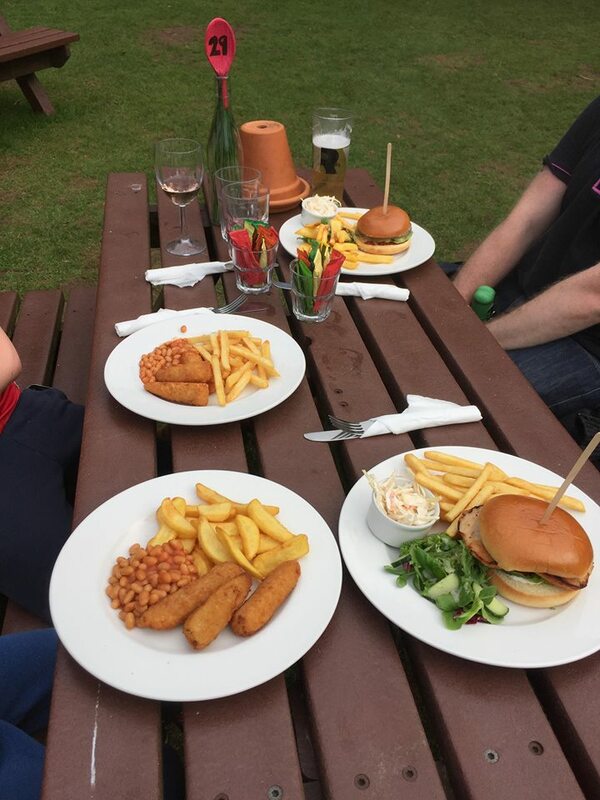 As we had our puppy Buddy with us and the weather was so beautiful we chose to eat outside over looking the vast green spaces where the boys played whilst we enjoyed a glass of wine. The food in the restaurant was lovely and fresh and very reasonably priced with all adults meals being under £10 and the offer that children’s meals are free with an adults meal when staying with them made it even more affordable. We spent the majority of the days visiting nearby attractions such as Charlecote Park but the early mornings and evenings were spent on site in the vast space surrounding the bell tents when glamping in Stratford-Upon-Avon. This extra space was a huge plus point for us as the boys just ran, climbed trees, played football and made new friends happily the whole time. There was also a field attached to the grounds that we used for walking Buddy and yet more playing for the boys, the site really did have everything we needed and we could have happily stayed an extra few nights if it wasn’t for the reality of school and work starting again this week. 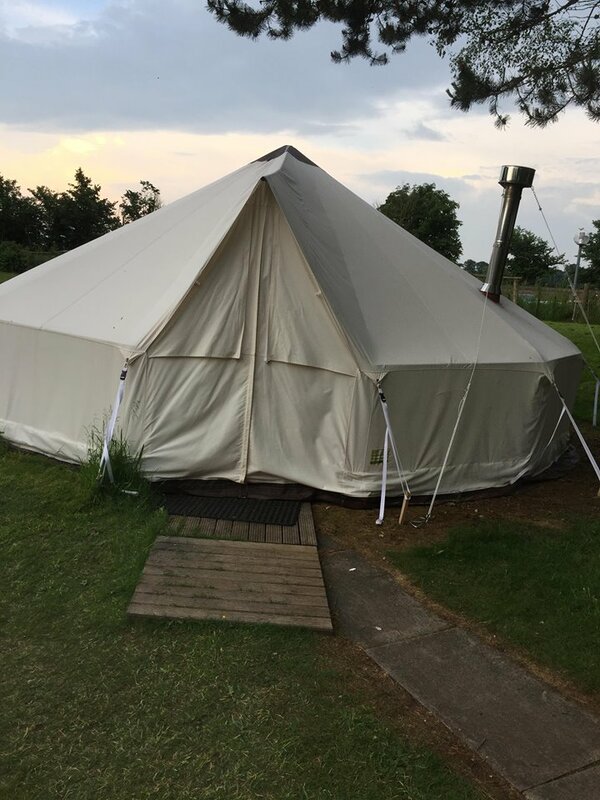 As well as the bell tents and the main hostel their are also pods for glamping in Stratford-Upon-Avon and although we didn’t review these I was given a sneaky tour of one and they looked fab and something we will definitely be looking at in the future. The bell tents sleep 4 and allows you to bring your dog along too, with prices from an amazing £39 per tent per night this really id the best option for glamping in Stratford-Upon-Avon. (Thanks to YHA for hosting us. All opinions are my own). This looks great fun! I have to admit I’m not really a camper after years of it when I was younger I much prefer more comforts but this looks like a good option than a standard tent! oh yes definitley more comfortable than standard camping, especially with the fire and comfy beds. Worth a try if you get the chance. It is just beautiful there isn’t it. We were really lucky with the weather in the days too so we could enjoy the sites, it was just a bit stormy in the evenings though. This looks great I have only camped once and hated it but this actually tempts me to try again! oh yes this is more glamping than camping and you should definitely give it a try. Ha yes this is more glamping than camping with full indoor amenities, proper mattresses and a fire. definitely worth a try if you get the chance.